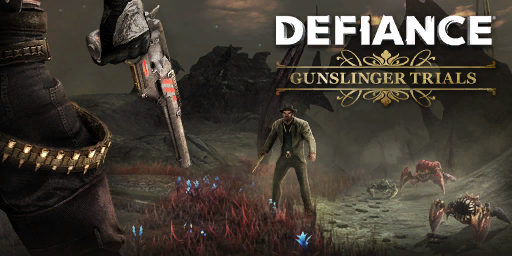 Gunslinger Trials also known as DLC 4 is the fourth Defiance DLC and was Announced Feb 11, 2014 and released March 11, 2014. This DLC focuses on some new storylines dealing with the fallout of VBI losing their leader and adding co-op arenas and a new scoring system. Von Bach Industries is in disarray. With their leader missing and presumed dead, three executives turn to ark hunters for help. Answer their call to arms and battle through new Co-op Arenas and story missions to reap rewards from the most powerful weapons manufacturer on Earth! New Missions: Follow three new mission lines as you assist VBI in the wake of Karl Von Bach's disappearance. Co-op Arenas: Nine new Arenas stand ready to challenge you and your friends. Arena Scoring: New system rewards you in real-time for smart cooperative play. Team up to disable and burst down enemies (and revive comrades!) to maximize your scores and ascend revamped leaderboards. Special Gear: VBI's new leadership has developed special gear to showcase each of their individual styles. New Outfits: Face VBI's challenges as a Gunslinger or The General. In this video Trick Dempsey the creative lead for Defiance talks about some of the new features in the DLC. Since the original video has not enabled embedding I have used a video that someone else has uploaded. 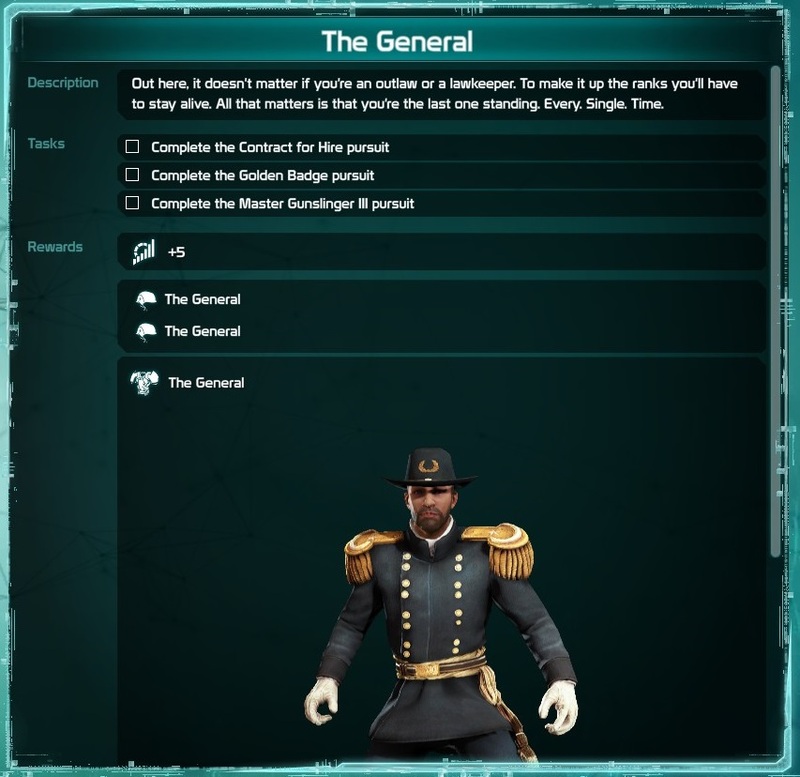 There are 3 new mission lines available that deal with three powerful figures competing for control of Von Bach Industries since the dissapearance of the CEO Karl Von Bach. It features 11 new cutscenes and 300 lines of dialog. There are several new items available and introduces a new mechanic to weapons that trigger EGO abilities. EEC SMG Based on the VBI SMG. 20% chance on a full reload to produce a Blur-like effect. Cooldown: 10 sec. EEC Sniper Rifle Based on the VBI Sniper Rifle. 20% chance on a critical kill to produce a Cloak-like effect. Cooldown: 10 sec. EEC HP-7 Wildcat Based on the HP-6 Wolfhound. 20% chance on a full reload to give a Overcharge-like effect. Cooldown: 10 sec. KLOC EVO Pistol Based on the VOT Blaster. Critical kills restore your shields by 10%. Cooldown: 10 sec. MASS-XL Ground Splitter Based on the VBI Grenade Launcher. When shields are down damage increased by 5%. XS600 Grinder Based on the VBI TACC Auto-Shotgun. When shields break, damage is increased by 10% for 5 seconds. Orejana Based on the VOT Fragger. Increases movement speed by 10% when under 33% life. Hog Leg Based on the VOT Tachmag Pulser. Increases rate of fire by 10% when under 33% health. Picayune Based on the VBI Autopistol. Increases Crit Mult by 10% when below 33% health. Awarded for completing certain pursuits. El Guapo A plethora of bullets. El Presidente "Hail to the chief." Increases Crit Mult by 10% when below 33% health. All previous arenas will be playable in a group, to do this you need to form a group first then one person enters the arena as normal and the rest will be invited in. Until Gunslinger Trials, arenas were something of an oddity in Defiance. They encouraged and rewarded a limited set of strategies – and not the kind we wanted to reward. So we revamped them with mechanics that support group play and give players a much greater variety of strategies to succeed. 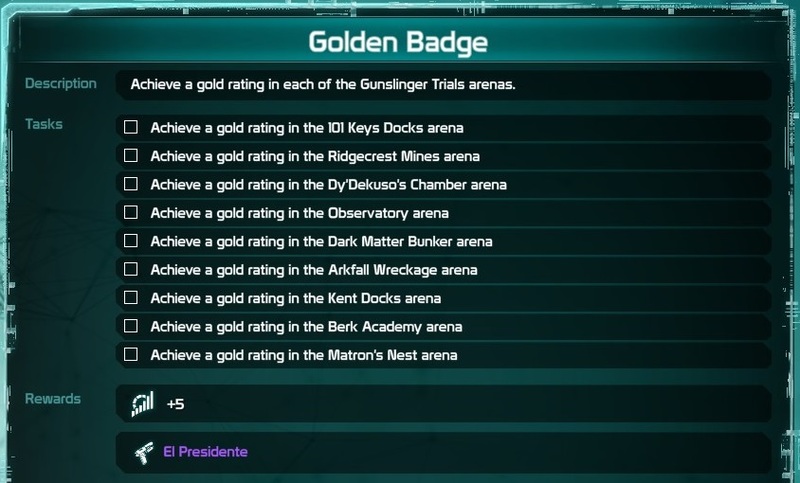 After Gunslinger goes live, you can battle through any arena as a group, sharing kill scores while receiving individual rewards for skill shots and special events (this does mean that a group of four players will DESTROY any of their individual scores in arenas prior to Gunslinger Trials!). The new arenas also present a wider variety of challenges and environments and give opportunities for all types of players and play styles to shine. On top of all this, they also contain story elements and objectives. They’ll feature all-new combat encounters in environments both new and familiar, from the interior of a newly crashed arkfall to a fateful showdown with Dekuso and his newly upgraded Raider minions. Our Gunslinger Trials DLC is right around the corner, and it adds a new feature that significantly improves the feedback and balance of existing and future events: Scoring. What does this mean for you? Better co-op, better rewards, and more reasons to play with your friends. How and why did we make this happen? Read on for all the details! Instead of sorting players by damage done, Gunslinger Trials’ leaderboards will sort by revamped score values that translate directly into rewards. Each point earned will contribute to XP, scrip, and keycodes. Gone are the mystical calculations determining who earned the top rewards and who did not, and that makes everything more fun. Additionally, scoring gives us the opportunity to present moment-to-moment feedback about success (and failure). While you will earn a “Hard Reset” bonus for stunning a Dark Matter Bulwark, you will also suffer point penalties for extraction and incapacitation. Strategies which revolved around repeated extraction will now result in very low rewards indeed. Teamwork rewards players for dealing damage to the same target. As players pour bullets into a Viscera, for example, they’ll see Teamwork points accruing in their score window. Opportunist is a bit different, rewarding bonus points for dealing damage to an enemy that is debilitated by a nano-effect. This even extends to bio grenades and pyro grenades. Both these grenades now turn their victims into big bags of bonus points. In addition, we’re exposing and restructuring the rewards players get for reviving allies. Each time you revive a new target in a single event, you’ll be rewarded points for doing so. As such, there’s no benefit for reviving the same poor sap over and over. On the flip side, reviving a large number of unique allies will now reward a lot of points. Several new pursuits have been added offering EGO Rating, outfits, a weapon and a title.